Package Quantity: 1 | Size: 16cm x 14cm x 24cm What Kind of Coffee Press Won The Hearts Of All Coffee Lovers? The Most Reliable & Durable Coffee Press In The Market - The Best Heat Resistant Borosilicate Glass--Your SterlingPro coffee press will work much longer for you. - The unique Double Screens System---No more GROUNDS in your coffee - Solid Packing--No broken gifts to your family members and friends. 100% Guaranteed No Grounds coffee From SterlingPro What is the worst coffee drinking exprience? Coffee grounds in mouth! That iswhy SterlingPro introduces the innovated and unique Double Screens Systemwhich is the only one in coffee press market. By adding the second screen, theprimary screen will touch the glass wall more tightly and evenly. At the sametime, the second screen will filter the tiny grounds which pass through theprimary screen. No more grounds in your coffee by using Sterlingpro coffeepress. You will love it after using it. Your loved ones will appreciate it andthink of you happily everytime when they enjoy the coffee from your gifts--SterlingPro coffee press. 2 Pieces BONUS Stainless Steel Screens(Over $25 Value)---FREE!! - When you receive SterlingPro coffee press it will be delivered in a solid packing and it comes along with 2 pieces extra screen. You will find they are over $25 value if you search on Amazon. - The limited quantity for this valuable bonus. 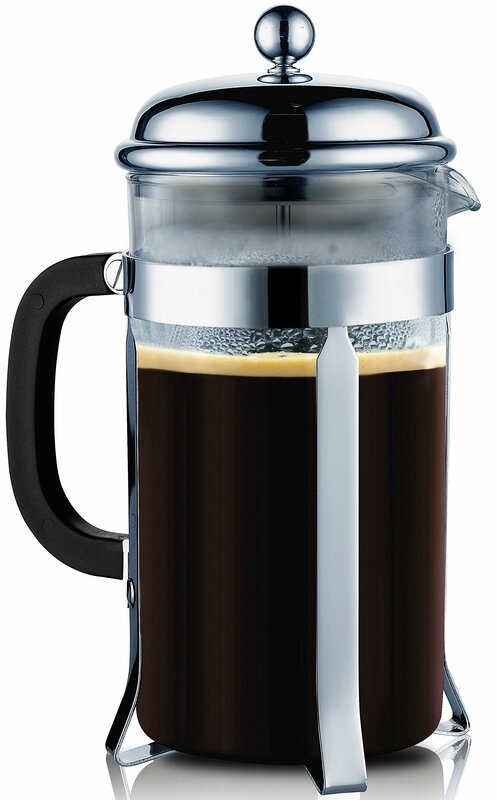 Please check the reviews of this item, you will find our SterlingPro French coffee press is "Great as Wedding, House Warming, Retirement & Birthday Gifts for Coffee Lovers" We are pleased to announce: This French Press has been rated as:"1 BEST SELLER","1 MOST WISHED FOR" & "1 GIFT IDEAS" in Coffee Press by amazon.--The real 1! Click The "Add to Cart" Button before the bonus screens run out!